This event was available from Tuesday, May 23, 2017 12:00 AM until the event start date. Singles … don’t miss this new opportunity! Jill Monaco, publisher of Single Matters magazine, is hosting a LIVE event for Christian singles in Grapevine, TX on August 5th. Jill is a certified relationship coach, popular conference speaker and published author. She has a huge heart for singles to be everything God created and redeemed them to be. She specializes in helping singles find what is holding them back from having a relationship they want. Not only in romantic relationships but also for friendships, in business and in your family. Jill usually coaches From Looking To Loving as an online course a few times a year. But for the first time, we are offering a LIVE EVENT! It’s all the same content compacted into one day. And you’ll hear Jill speak LIVE and have a ministry team there to pray for you. There are four things that you really need to attract the right person and avoid the wrong people. These things also will help you sustain a healthy relationship and marriage! Learn how to partner with God by getting rid of defense mechanisms, overcome life patterns that keep you stuck in a cycle of rejection, and walk in such confidence that you are never afraid to date again. 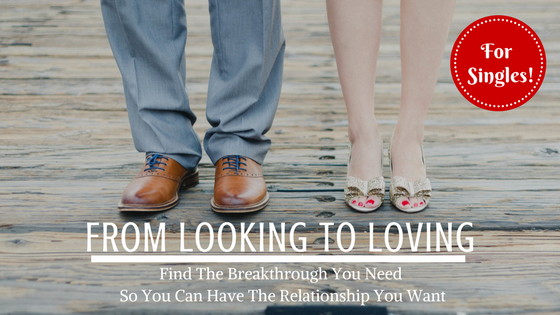 Find the breakthrough you need so you can have the relationship you want! This event is for singles who want to be married and those who aren’t sure. The best part? When you take the course online, it’s normally $297! But we are offering it for just $47 for the LIVE event! The event registration starts at 9am and ends at 9pm. Lunch and dinner is on your own but we give you plenty of time to grab something great in the Grapevine area. P.S. If you want to learn more about Jill, visit www.jillmonaco.com. Or visit the magazine for singles at www.singlematters.com. Parking is limited to street or the garage in the apartments behind the building.